How often does eating out help you make a difference for others? I'm guessing not often. Well coming up this Thursday is your chance to do just that. Boston's first ever Dining Out for Life is taking place and a dozen or so restaurants are getting together and donating for a worthy cause. 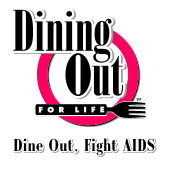 This Thursday Da Vinci Ristorante will take part in Boston’s first ever Dining Out for Life event. For this special night, Da Vinci and nearly a dozen other local restaurants will donate 25% of their total sales to local organization, Cambridge Cares for AIDS. Da Vinci will highlight this special occasion with their exceptional hospitality and a special guest host. Da Vinci Ristorante will be taking part in Boston’s first annual Dining Out for Life event this Thursday. For one special night, Da Vinci and nearly a dozen other Boston restaurants (including KO Prime, Picco and Bambara, to name a few) will kindly donate 25% of their total sales for the evening to help local organization Cambridge Cares about AIDS (CCA) continue their cutting edge, community-based programming into the future. Note: From the website, it looks like this event is only going on for dinner on 4/29. 1 Response to "Charity: Dining Out for Life - 4/29"
This is a great cause. Just like you said, how many times do we get to make a difference while eating out? I will have to definitely check out this event and see what it's all about. Thanks for all the information.